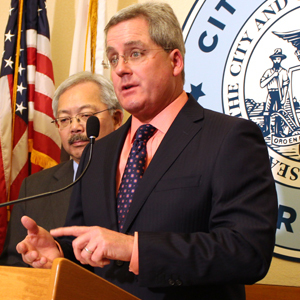 City Attorney Dennis Herrera at a press conference Jan. 31, 2017 announcing his lawsuit against President Trump for his unconstitutional executive order targeting sanctuary cities. “We think that today’s argument went well, and we are hopeful for a positive decision from the court. The president’s motion was a desperate Hail Mary to defend an executive order that is not only patently unconstitutional, it’s un-American. This administration is ignoring federalism and the separation of powers like they’re simply more inconvenient facts for a president who seems allergic to the truth. The law doesn’t allow the president to do what he’s trying to do. We don’t live under an emperor. The president does not wield the power of the purse, and the federal government cannot force local governments to do its job for it. That’s the law. Attorney General Jeff Sessions’ May 22 memo is a woefully inadequate attempt to rescue an executive order whose constitutional flaws are so deep it can’t be saved. Even though we have forced the administration to back down and dramatically narrow the funding at stake, threats from this president continue. San Francisco fully complies with federal law. It’s time for this president to do the same. This executive order also doesn’t make sense. It won’t improve public safety. It will do the opposite. While the president plays to people’s fears by demonizing immigrants, the evidence is clear: not only are immigrants less likely to commit crimes, sanctuary jurisdictions also have lower crime rates. That’s because victims and witnesses are willing to come forward and report crimes to police. That gets criminals off the streets and makes everyone safer. The president likes to spread the falsehood that sanctuary jurisdictions harbor criminals. Not true. The federal government knows everyone in San Francisco’s jails. We send them their fingerprints. If the federal government thinks someone is dangerous, all they need to do is get a criminal warrant or a court order.